I’ll be reading from my novelette, Sejal: The Walk for Water, this Saturday at 11:00 a.m. on the Word is Art stage at the Columbus Arts Festival. Four authors were selected to read tomorrow, for a one hour program. I’ll be joined by fellow CCC author Heather Sinclair Shaw, whose story “Chrysalis” was also featured in Best of Ohio Short Stories. The festival is free to attend, including the Word is Art stage. It’s always been a really cool festival, you’ll want to find a time this weekend to check it out. I read recently that when John Steinbeck published The Grapes of Wrath, it was criticized as being a polarizing exaggeration of the situation facing America. In fact, Steinbeck was toning down the true stories of the dust bowl that he was basing the story on. Today we celebrate the story as a remarkably accurate, though anecdotal portrayal of real life for many during the Great Depression. 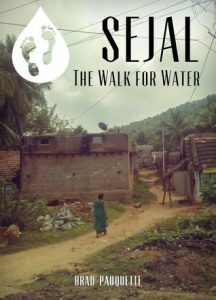 When I wrote Sejal: The Walk for Water, I presented it to a CCC writers’ workshop and feedback that I consistently received was that I didn’t make Sejal’s life bad enough. But when I created the character, I wanted her to seem normal, I wanted to demonstrate that the water crisis is horrible for regular people. I wanted the reader to know that these are things that happen to normal people every day in rural India–the worst thing that could happen would be for the audience to write off Sejal’s situation as some sort of outlandish worst case scenario. Yesterday, my friend Kirby sent me a link to an article about two teenage girls who were brutally gang raped and murdered in India. They had left the safety of their homes at night to use the restroom in a field, that’s when they were assaulted. Their homes had no running water or plumbing. Just like Sejal, one of the girls was fourteen years old. The water crisis is real, and the effects extend far beyond thirst. It’s true that a clean, fresh water well wouldn’t have averted this particular assault and murder in India. And no amount of indoor plumbing will address the culture of intolerance and hatred which fueled an incident like this in the first place. It’s estimated that 5,000 children die every day around the world due to unsafe drinking water. Many of those are in India. And that doesn’t even begin to factor in the many, many stories like this one, or the violent confrontations spurned by competition for water resources, or the lack of productivity due to time spent collecting water, non-fatal sickness and chronic dehydration. When Kirby sent me that article, it broke my heart. It crossed my mind that sharing it with me might have been a vindictive act designed to ruin my night. But I know the truth is that lots of people, including Kirby, share my despair over situations like these, and share my passion for the very real steps that we can take to improve the lives of so many. If you haven’t read Sejal, I hope that you will. And know that this story is the rule, not the exception. The exceptions are so much worse. You can download Sejal for free here, or you can buy it from Amazon.com or most other major retailers. If you purchase it, all of the proceeds I receive as the author of the book will be donated to The Water Cycle Project.